Mayabeque Province is ane o twa new provinces in Cuba, which creation wis appruivit bi the Cuban Naitional Assembly on 1 August 2010 bi splittin La Habana Province. 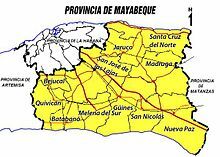 Mayabeque comprises the 11 eastren municipalities o La Habana province wi the caipital in San José de las Lajas. Mayabeque province takes its name frae the Mayabeque river (the lairgest in this territory) as well as, frae the Mayabeque beach, in the sooth shore, the place in which is believit the oreeginal Havana veelage (San Cristóbal de La Habana) wis foondit in 1514. Sicweys, the new province becomes the smawest (excludin Havana ceety province) an least populatit in the kintra. The new provinces wur enforcit on 1 Januar 2011. Mayabeque's economy is based on Agricultur (potatoes, fruits, vegetables, succar cane) an livestock fermin, pairticularly milk production. It haes a relevant industry sector an aw, mainly in San José de las Lajas an Santa Cruz del Norte (biggin materials, electrical cables, rubber industry, gless vessels an ceramics, fuid processin, paper processin, succar mills, twa lairge rum factories (Havana Club brand), biopharmaceuticals (in Bejucal), fishin products, pouer plants an ile an gas extraction). It haes important scienteefic institutions anaw an varsity in the field o agricultural science. ↑ ¿Por qué Artemisa y Mayabeque? This page wis last eeditit on 10 Mairch 2018, at 21:27.